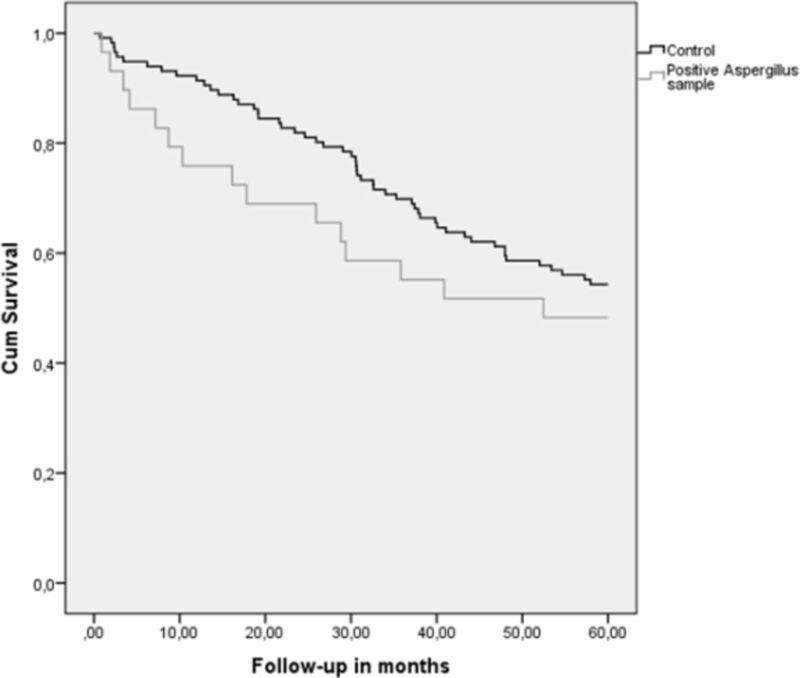 Aspergillus in COPD patients; is it a predictor for mortality? Introduction: Aspergillus can cause a variety of clinical syndromes in the lung, the most common are invasive aspergillosis, aspergilloma and allergic bronchopulmonary aspergillosis. Although Aspergillus is regularly isolated in sputum samples from patients with an acute exacerbation in COPD the clinical significance remains unclear. Aim: The aim of this study was to investigate if sputum cultures positive for Aspergillus in COPD patients are a predictor for mortality. Methods: In 29 of 795 patients of the Cohort of Mortality and Inflammation in COPD (COMIC) study there was a sputum culture positive for Aspergillus . Per positive case, 4 controls (in total 116 patients) were frequency matched based on inclusion date. Outcome parameter was 5-year mortality, based on all cause mortality. Results: Baseline characteristics between the groups (e.g demographics and lung function measures) were equal. The log-rank test showed no signifance difference (p=0.323) between the COPD patients with a sputum culture positive for aspergillus and the control group (figure 1) in mortality. Conclusion: A positive sputum culture for Aspergillus is not a predictor for all-cause mortality in COPD patients.